The pick-up market rarely inspires thoughts of efficiency. These big-chassised beasts deliver power, not eco-friendly technology. They consume fuel to adapt to every environment and every pay-load. Ford - in its quest to redefine automotives - has changed this. The 2015 F-150 was just named Green Truck of the Year! According to USAToday, Ford’s 2015 F-150 earned recognition at the San Antonio Auto Show. The pick-up (along with the Chevrolet Volt, which was named Green Car of the Year) was noted for its economical construction and fuel-prep package, which allows it to use both natural gas and propane. This ensures fewer carbon emissions and a more efficient allocation of resources. Less gasoline is needed to take advantage of best-in-class towing. The 2015 F-150 has inspired much acclaim. and this latest award merely continues the F-Series' tradition of innovation. High performance now combines with hybrid capabilities. To learn more about the San Antonio Auto Show click here. 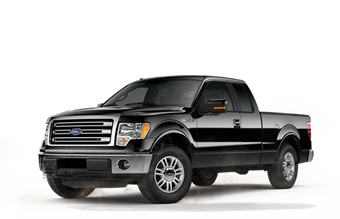 To learn more about the 2015 F-150 (as well as other Ford models) contact us today! On November 6th, SEMA 2015 came to an end - forcing more than 100,000 manufacturers, engineers, and product developers to trudge out of the Las Vegas Convention Center and return to the real world. Though leaving behind the dizzying array of custom cars and next-gen innovations proved sad, there was at least one happy thought to sustain these spectators: the Ford F-Series had won Hottest Truck. On SEMA’s opening day, critics crowned the 2016 F-Series the Hottest Truck. According to the Du Pont Registry, this victory was well-deserved, with the pick-up delivering exceptional power, performance, and styling. Seven modified F-150s debuted at the 2015 show - including the MRT 6-SIX, the Leer Edition Outdoorsman, the ROUSH, the CGS Performance, the AirDesign USA, the Forgiate, and the Gulf Livery Galpin Auto Sport - and each helped to secure a victory for Ford. The Novlan team isn’t surprised. Each of these options promises incredible backroad results and we hope to see them roll off the production lines (and onto our lot) soon. To learn more about Ford’s F-Series collection - as well as its other award-winning models, including the 2016 Mustang and the 2016 Focus - click here. To learn more about SEMA 2015 click here. Be sure to contact us as well with any questions related to SEMA 2015 or the F-Series. We’ll gladly provide specs, pricing news, and more. In the northwestern corner of Ohio sits the town of Napoleon. It’s a tiny place named for an equally tiny emperor, with a population hovering below 9,000 and a brick-faced downtown. It’s quiet; it’s secluded; it’s... the ultimate F-150 tribute. Travel just beyond Napoleon and visit Leaders Farms, where the Ford F-150 has been creatively brought to life in a seven acre corn maze! Leaders Farms - managed by husband and wife team, Brad and Kristen Leaders - is the agritainment capital of Ohio, blending maize and mazes in a fun new way! Watch below as it transforms the F-150 into a series of twists, turns, and exciting pathways. The F-150 inspires drivers across North America - and rightfully so. This pickup delivers incredible power, with its 5.0L V8 dominating every road. Combine this with the new Pro Trailer Backup Assist system (which allows for more precise navigation) and the value of compressed natural gas fuels (which reduced overall emissions) for a superior experience. It’s no wonder that the Leaders Farms team wanted to celebrate! Halloween is getting a Ford makeover this season.... and we wish we were in Napoleon to see it. To learn more about the F-150, as well as other F-Series models, contact us today. We’ll gladly provide specs, prices, and more. Few numbers prove as elusive as 200,000. This mileage milestone is rarely achieved, with many cars rattling themselves to the junk-yard before they get the chance. Their engines falter; their chassis rust; and their wires all fray. It seems impossible to cross that finish line. One proud Ford owner - known on YouTube as ApplesMauce - did just that, however. Watch below as he takes his F-150 to the 200,000 mark! The F-150 is a premier pickup. It’s no surprise, therefore, that it was able to survive 200,000 miles of backroads, highways, and forgotten trails. It’s engineered for endurance, serving as Ford’s most tested vehicle. Each generation receives a series of brutal simulations (including salt sprays, acidic sprays, and arctic temperatures) to push the truck to the utmost limit. For ApplesMauce, that limit no longer includes the 200,000 milestone. Be sure to send us your F-150 tales as well! We’d love to hear about the personal records you’ve set for distance, towing, hauling, and more. Along the Las Vegas strip comes a wave of exhaust - with cruisers, roadsters, and convertibles roaring down the street toward the 2015 SEMA Show. They’ve come from across the globe, bearing logos from the leading manufacturers (Ford, Toyota, GM, Honda, and more). Each promises next-generation tech and high speeds. And among them - hidden in the chrome and smoke - are new F-150s. These vehicles - which boast a bevy of new features, including: Freak-O-Boost intercoolers, Whipple superchargers, cat-back exhausts, Reikken batteries, and RS7000 struts - promise exceptional performance. Each emphasizes best-in-class payloads and enhanced speeds, making them ideal off-roaders. We can’t wait to test them out! To learn more about the 2015 SEMA Show visit its official site. Be sure to contact us with any F-150 questions or comments as well! What’s that sound? Could it be the roar of a V6 engine, powering across the dunes of Silver Lake State Park? Could it be the smooth acceleration of a twin-turbocharger? The 2017 F-150 Raptor is coming! In 2010 Ford introduced the world to its Raptor lineup, injecting off-road fun into its F-150. Since then, the truck has become a powerhouse performer on both the charts and the back-trails. The 2017 variant looks to be no exception. Watch below as Ford showcases its latest Raptor, testing the new design (500 pounds have been removed, with aluminum framing leaving the truck sleeker, faster, and more economical) against the dunes at Silver Lake State Park. The 2017 Raptor promises exceptional performance in any environment, even ones as challenging as the Silver Lake dunes. Though no official production date has been set, most critics expect an early summer release next year. We can’t wait - can you? To learn more about the 2017 Raptor contact us today! Rob Evans is no stranger to hard work. As the host of HGTV Canada’s The Expandbles - as well as the the popular Home to Flip - he spends his days stripping spaces to their studs and transforming every corner. It’s a series of renovations, restorations, and reinventions. It’s also the perfect reason to drive a Ford F-150. Watch below as Evans explains the demands of his construction career - and why he trusts a F-150 for everyday hauling, towing, and more. The F-150 has its origins steeped in blue-collar efforts, and Evans’ use of the truck showcases why. Through innovative features - such as an aluminum body, best-in-class towing, best-in-class payload, and the redesigned BoxLink - Ford delivers high performance in every environment. This makes it ideal for everyday demands (like construction). It’s no surprise that Evans relies on the F-150 to complete every job. This is a premier pick-up - and we’ll be sure to watch The Expandables to see it make its HGTV debut! To learn more about the Ford F-150 contact us today. Check Out Photos Of The 2017 Ford F-150 Raptor! In 2010 Ford introduced drivers to a new generation of power - the F-150 Raptor. This specialty off-roader impressed with its Fox shocks, V8 engine, and six-speed gearbox: which combined for superior terrain traction. It delivered undeniable performance on the back trails. Now Ford has a new Raptor to unveil - the 2017 F-150 SVT - and it looks even better than the original. Check out these spy photos of the 2017 Raptor, as provided by AutoBlog. They showcase the truck's rugged lines and extended fenders. The use of aluminum materials proves most interesting, though: highlighting Ford’s dedication to economy. This SVT will be lighter, faster, and less fuel-consuming. That’s something every driver will certainly appreciate. No official date has been released for the Raptor’s production schedule. Critics predict, though, that it will arrive by mid-summer next year. We’ve got our fingers crossed that this timeline proves true. To learn more about the 2017 Raptor - as well as other F-150 variants - contact us today! The 2015 F-150 has inspired much acclaim, with critics noting its aluminum frame, efficient engine, and best-in-class towing. It’s generated strong sales and stronger interest, with even competitors (like GM) launching their own light-framed options. It’s an undeniable success. It’s also undeniably colorful, with 13 metallic shades available. Which of these proves most popular? A recent News Wheel article conducted an extensive poll across North America to find out. Black and white reign supreme among the 2015 F-150, with North American drivers overwhelmingly choosing Oxford and Tuxedo. Novlan is sure to stock both of these options - as well as the 11 other color choices Ford offers. With the release of the 2015 F-150, Ford redefined pick-up performance. Its innovative use of aluminum framing (with traditional steel sent to the scrap yards, taking its excess weight with it) ensured steady economy and effortless steerage, allowing the truck to more effectively adapt to everyday demands. Critics and drivers alike have celebrated this decision. Now there’s yet another reason to celebrate - because Ford is partnering with Alcoa for its 2016 F-150. According to Seeking Alpha, Ford and Alcoa (the Aluminum Company of America) are joining forces for the new F-150. The two will collaborate on a next-generation frame alloy. This alloy - known as Micromill - promises up to 30% more strength, allowing it to withstand daily rigors and potential collisions. It also requires less time to manufacture, streamlining the building process and increasing overall production. This proves key for Ford, who struggled early in 2015 with F-150 assemblage. Lines were slow and sales slipped, causing many to wonder if the aluminum decision was a wise one. Micromill will ease those doubts. To learn more about Alcoa visit its official site. To learn more about the 2016 F-150 - as well as the partnership between Ford and Alcoa - contact the Novlan team today!